It made me hungry. I feel like I’m in a program that really helped me individually as a player. I feel like I’m with a group of guys that are like my best friends. We have a saying in France. A dog doesn’t make a cat. 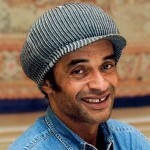 Yannick Noah is a former professional tennis player from France. He is best remembered for winning the French Open in 1983, and as a highly successful captain of France's Davis Cup and Fed Cup teams.